I'm a fan of red wine in desserts (you know this, right? ), and I've seen lots of boozy lollipop recipes, but none containing red wine. I did a good bit of searching online, and even in my personal stash of candy cookbooks -nada. I became obsessed with the idea of a red wine pop, and my mission soon became clear: get in the SB test kitchen and fill this terrible void in the confectionery world! It took a few tries. First, I used the liquid/sugar ratio for a standard pop, but the flavor was lacking. I increased the red wine, only to find the candy wouldn't set properly. I knew better, but I did it anyway. A while later the correct synapse fired in my brain, and the answer was simple: make a red wine reduction. This gave the lollipops big-time flavor and a beautiful color. I dressed up the lollies with gold luster dust, and the technique could not be easier! 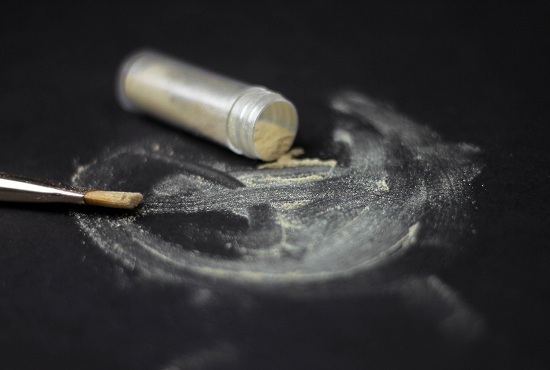 Brush luster dust over the dry lollipop surface and dip it in a glass of room temperature water; shake off the excess then lay it flat on a piece of parchment paper. The gold dust will separate a little while the lollies lay flat. Leave them to dry overnight. See? Easy! And perfect to hand out for Valentine's day. After much deliberation, it looks like I will be attending Blissdom this year! I can't wait to meet some of my favorite people! I am still loving my special purpose camera, but my poor dogs may go blind from the flash. I can't help that they are so photogenic. NOTE! This recipe has proved to be difficult for some. Please read all the comments before attempting this recipe. Note: You will need hard candy lollipop molds or a silicone mat. If those are not readily available, parchment-lined cookie sheets will also work. Bring red wine to a simmer in a small saucepan. Simmer wine until reduced to 1/3 cup, this should take about 20-25 minutes. Remove from stove-top and let cool completely. In a medium saucepan combine sugar, corn syrup, salt and wine reduction. Stir until combined. Clip a candy thermometer to the side of the saucepan and bring to a boil over medium heat. Stir occasionally with a heat-proof spatula until all sugar granules have dissolved. Boil until candy temperature registers 298-310 degrees on a candy thermometer. Remove from heat and fill greased lollipop molds with the hot candy. Place lollipop sticks in the stick crevices and rotate until the stick is coated in the hot candy. Alternatively, you may also drop the hot candy from a spoon onto a silicone mat or parchment paper, making two to three-inch disks and leaving room to place -and rotate- the lollipop sticks. Allow the lollipops to harden completely. These are best if you wait a day to consume them, as this gives the red wine flavor plenty of time to develop. Edit 2/7/12, TIPS: Many of you are having trouble with the candy burning. I just made these again to make sure I didn't make a mistake or leave something important out. Mine came out perfectly, again. I suggest boiling the candy to 298 degrees instead of 310 degrees (the candy will keep cooking a little after it is removed from the heat source). The candy will caramelize just slightly, but it should not be - or taste- burnt. I use a digital thermometer, as it is easier to read. Also, don't use a large pan in which to boil the candy, or it will certainly burn. If candy continues to burn, it could be your pan - you may try adding a couple of tablespoons of water or wine from the bottle to the reduction/sugar/corn syrup/salt mixture. The photo of the lollipop over the wine glass is absolute magic! I love it. What a clever thing you are! yeah, I was excited to see a post from you. These are ever so lovely! What a super idea...I'm sad I just left the store without the luster stuff...I almost...almost...bought some. I gotta get me a lollipop mold, just for this treat. I wonder if you can do the same thing with lime and tequila? love that color red; wouldn't that make a fabulous pair of shoes? I found this recipe via Pinterest. What a fantastic idea for Valentine's Day treats! Those are very pretty! I wish I was a drinker and could actually try them! These are so lovely. I have lolly molds and luster dust just waiting to be used! Beautiful lollipops! So pretty and surely divine. I love the idea. These are freaking brilliant! Ughhh I want one so bad right now!! I don't suppose you've seen Bernard's lolly on Black Books? Oh my stars, this is a fantastic idea! I am just now finding your blog and I love it. You are going on my list of favorites sidebar. Hope you're having a great weekend. these are so creative! i love the deep red color! This is genius, I'll definitely be giving these a try! Inspired! I'm making these for my next dinner party. I love wine. And lollipops! I confess that I have a Blo-Pop or Tootsie-Pop lollipop many times per week, HCFS and all. Must replace that with wine and try yours. I haven't had a lollipop in a long time, but this is amazing! it is... i have no words!! really special! thanx for share! hugs from spain! I think you may have just started a new trend in lollipops. These look wonderful and your photographs are superb. What a great idea! These would be such fum as a party favor. Another brilliant idea. I love red wine in an form. The gold dusting on these is just magical and that Chicken marsala story is hilarious. I'm not a big red wine fan, but these are so adorable, I'd love to have one! And that luster dust is gorgeous, Heather. P.S. My heart goes out to you that you used powered sugar instead of flour and couldn't eat the chicken! Awesome! I'm assuming that you used PAM to spray the molds with? I'm a Reisling and Muscado girl, so I'm hoping this works with them too! Thanks for sharing! Good call on the red wine reduction!!!! These sound very intriguing! Port is one of my favorite liqueurs. I would go lolly if someone handed me a wine soaked lollipop! What a grand idea!! I would never think to make red wine popsicles. What a brilliant idea! Never would have thought of this. Like you said, a nice treat for Valentine's Day too! Fabulous!! LOVE, LOVE your ideas and the photos! Whoa good idea! Way to be. Wow. Amazing! Glad you figured out how to make these and make them tasty! they look so pretty and sound delicious! Love the photography too! Absolutely beautiful! I want to make for my wedding... how early can I make them? You never cease to amaze me with the beautiful pictures of the things you make! 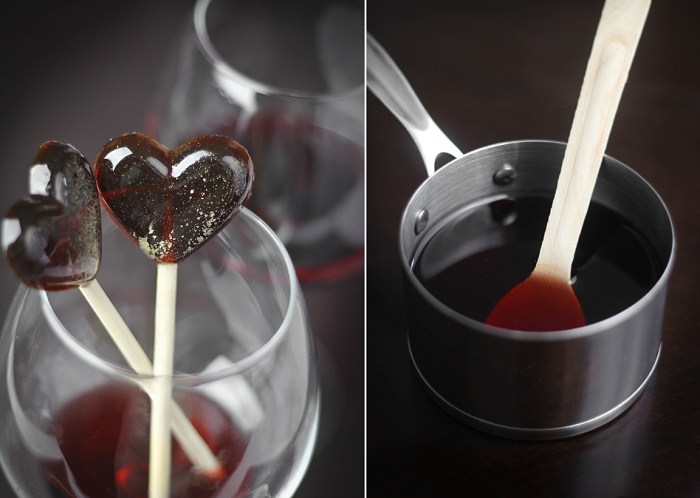 I love the idea for red wine lollipops, but your pictures are so amazing. They really make your food, I would want to eat a bag of these!!! Hello Heather~I've just strolled in for my first visit...I've enjoyed taking a peek at your past posts. You've got so many amazing confections. Your blog is so beautifully inviting. We share similar taste for so many of the same food elements. I'm so excited give a try in making these lollipops. These are fab! Seeing the pics made me fear that super-complicated sugar craft was involved, but this seems do-able! Ooh the possibilities! A whole array of cocktail lollies springs to mind - thank you for this now I know I will be dreaming of making lollies for the next week! Love the photography as your lighting and composition really draws the reader in - I however must practise more! Stumbled upon your blog via Pinterest. Great photos, great recipes! A new favorite. Keep up the fantastic work. I will be making a big batch of these for Valentine's day. What a sweet grown up treat! These were so tempting that I made a batch tonight, but I struggled with the temperature. My sugar just likes to burn after 300 degrees! Maybe next time I'll try pouring it at 300 instead of 310. Candy is such a fussy thing! But these are too wonderful to give up on the first try! I tried a batch last night and one again this morning and they both burnt before they reached the hard ball stage... any suggestions? Well gosh. It's hard to say what went wrong. What type of pan did you use? And let's see... I can suggest you turn the heat intensity down. You want a low slow boil, so once your candy starts to bubbling keep it a notch below medium heat. It should take a little while to reach 300. If you still have trouble, you may want to check your candy thermometer's accuracy or positioning in the pan. I invested in a digital thermometer and have had better results with my candy (or maybe you already have one and that's not the problem). Sorry you've had a spot of trouble with this! Seriously your a genius! I'm obsessed with this idea now. MUST MAKE! Brilliant! 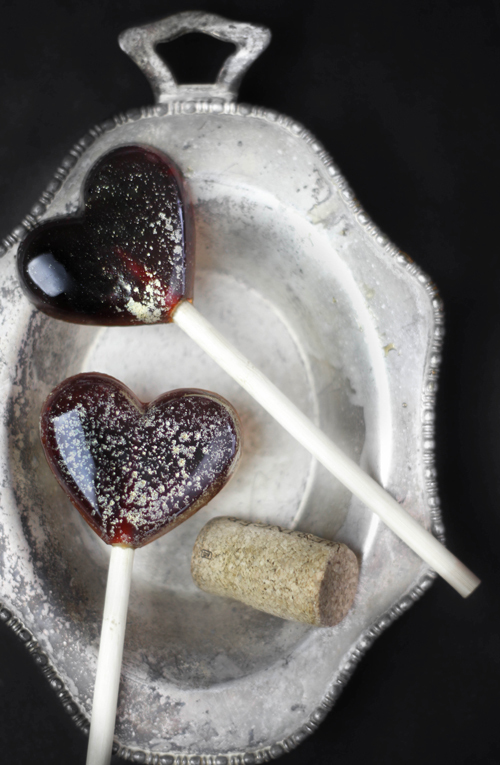 You mentioned other boozy lollipop recipes - have you tried any of the others? I'm not a huge red wine fan, but I love the concept. I bet they taste good too!! Wasn't there a Doris Day Rock Hudson movie based on alcoholic treats? Doesn't making a reduction cook off the alcohol? Yes! Of course. The alcohol cooks out. You won't get a buzz with these, or any other hard candy liquor lollies, but the flavor is there. So pretty, love the little touch of gold too! Awesome idea but I just tried the recipe and failed miserably. My candy thermometer was too large for the saucepan and wasn't recording the temperature correctly. I burned them. Argh! I'll try again with an appropriately-sized thermometer. Tried this recipe twice and unfortunately ended up with burnt tasting pops. I was very careful with the rate of cooking and heat intensity and even pulled them off the heat when the thermometer reached 300 figuring it may continue to rise as I am pouring. I did notice that just as it approached 290 the color went from a pretty purple to a more brownish color. I am going to try again tonight. I am determined to master this one! Robin, If you are having trouble with the candy tasting burned,try adding 2 tablespoons of red wine from the bottle in addition to the reduction. This may help! eeek! !looks so wonderful!wanna try for my trip to Napa! So I just finished making these beautiful lollipos and mine taste burned I have a brand new thermometer that's digital and don't understand why it burned. Any advice? Hey Jessica! I just made an edit with suggestions in the text (just above the recipe). I made these again tonight and mine did fine. Wish I could be in the kitchen with you!! Would this work with a dry red wine as well? Or an off-dry white, like a Riesling with a bit of sweetness? Hi there! I'm in love with this and made my 1st batch this afternoon. I was wondering if you had any tips on getting them out of the molds without pieces sticking to the mold, etc. What did you grease your molds with? Oh! Just one more question ... I tested the gold dust on two of the lollipops, and after leaving them out overnight on paper, they look pretty and glossy — but theyre super sticky. Do you think I used too much water? Mine were super sticky too after I dusted them with luster dust and dipped them in water. I was wondering if either a) they are just sticky lollipops or b) if I should have brushed them with water instead of dipping them or c) if I didn't let them set long enough prior to dipping them. If anyone has a comment on this, I would appreciate it. I made another batch this morning before I left for work and I'm debating whether or not to try the luster dust and water again on this batch. Hi Carrie! I used a cooking spray (the oil sprays you find in the baking aisle) and mine popped out with just a small twist of the lollipop stick. Carrie and Emily: As for the stickiness, mine dried rather quickly, but I did have them close to a warm fire place so that could account for the quick drying. You could try brushing on the gold dust, and then let a few drops of water fall from the brush onto the lollipop's surface. That way you aren't over saturating it. The ones you made are probably salvageable though, they'll just require more drying time. Definitely change out the sticky parchment paper they are laying on. I really thought that the people that were having trouble with burning the candy just needed a better thermometer...until I tried it myself. My first try: I calibrated my thermometer, used a small light colored pot, and followed the directions exactly. My results: brown lollipops that tasted burnt and were sticky all over. I re-read, did some research on my own and decided to try again. My second try: Dissolved sugar in reduction on low heat first, then turned heat up slightly and simmered until mixture reached 298 degrees. My result: brown lollipops that tasted burnt and were sticky all over. I am making these for a party and did the first batch and came out perfect. Other than the fact that I only had two molds, waited till the last mintute and had to remove the candy from the molds early to get my second batch in. Im just reshaping those that are on the parchment paper as they cool. I used Barefoot sweet red and gold pearl dust :) What a great recipe ! athough im hoping im remember what i used first for ingrediats and is was just taken off the site before my second batch ! ha ha i think i have it figured out. Thank you for sharing - Happy Valentine's Day! Thanks Anonymous! Good to know it's turning out for some! I still have the recipe up at SprinklePrints. You can find it here. I really am starting to think that the difference is in the wine that is used. For those of us that have tested our candy thermometers, (I even used 2 different ones for the same batch to be extra sure), this is the only thing that makes sense for causing the burnt taste. Maybe different wines break down at different heat levels? I really want to try this again but I'm not sure about buying and possibly wasting more wine. Has anyone tried this recipe with, say, a shiraz or another fruity but less expensive wine? What about the wines that are just labled as "sweet red"? I will say that using a digital thermometer is probably a huge part of it because it totally removes any guess work on the tempurature, so long as it is calibrated first. I just made these for a wine tour birthday party and they were a huge hit!!! I used a Cabernet and removed the pan from the heat at 292 as the mixture continues to cook. Good luck - these are so fun!! They came out great for me! I used a Port at 18%. Thanks for the recipe! I made these 5 times and every time they were brown and bubbly. Two patches were burnt, one was not at hard crack. The last two tasted ok, but they were brown and bubbly. NOT clear and red. The mixture bubbled over both times. I tried port, sweet red wine, and syriah. Frustrated but determined. Any suggestions? I just made these and they are cooling... I don't actually remember what wine I used, something the Trader Joes guy suggested for being medium sweet. What I scraped out of the pan tasted really good, and nothing seemed to be burnt. My batch made about 19 suckers though - perhaps my molds are just small? The mixture was making noises in my pot though so I just stirred continuously until it bubbled up, then took it off the heat and stirred it until it calmed down again, returned it to the heat and let it bubble up once more... then I took it off the heat and stirred it until it was clear again and then poured it. Please repost the recipe again! I would LOVE to try these! I have made these several times too & each batch has burned. The last batch burned at round the 265 mark on the candy thermometer. I am thinking stove temps/intensity ( gas vs. electric), etc. may vary and, as someone else noted, the wine you are dealing with makes a difference. I am using a gas stove and have found it best to simmer the wine on low, as well as the candy mixture. . I was close with the last batch, for which I used cabarnet. I am also thinking of doing it the old fashioned way (you know, dropping the sugar mixture in a clear cup full of cold water to see whether it's reached the right stage). I love this. Has anyone tried making a champaign or sparkling wine version? I make a LOT of mulled wine every winter (I live in Canada: it gets cold!) and have noticed that wine itself can burn. And it taste awful. Looking forward to trying these, I preserved some fresh cherries in wine this summer, I bet the syrup from those would be DIVINE in a lollipop!! I have made a lot of lollipops over the past few weeks (I'm using them as favors for a christmas party) and there is something weird about this recipe. 2. Burning -- Since I've been making a lot of hard candy I have a good feel for temp and I trust my candy thermometer. I think this base started burning as early as 240 degrees which doesn't make much sense. I eventually pulled it at around 280 (20 degrees before hard crack) because it was just too obviously burnt. I also noticed that you start with a higher liquid to sugar ratio and that you use less corn syrup than I've used in other recipes (your siracha lollipop recipe uses 2 c sugar to 2/3 c corn syrup to 2/3 c water). I wonder if this is somehow causing the issues with the recipe? I just made a batch and it was sheer perfection!! I used a red blend and added just a pinch more sugar. Amazing recipe. Amazing results. THANK YOU!! I WOULD PAY to have some one make these for my wedding! I made a version of these this weekend that I did with Dogfish head 60 minute beer. They were not sticky or burnt at all but they were brown as the beer reduction is brown.I did have problem with the lollipop mold but my hard candy silicone molds turned out great. Thank you very much for looking out for me. Listia is not being very helpful, but I did file a complaint and fill out their insulting form letter. ive tried making these twice and both times they set well, i was able to pull them out of the molds, but afterwards they started to soften and it becomes a sticky mess, any tips? did i not cook the candy long enough on the stove? If you are having trouble with the candy burning you could try using a double boiler, this way the pan does not come in direct contact with the heat source. Gorgeous lollies-beautiful ruby red, perfect for Valentine's Day! I love the idea, especially the gold dust. Great pics. I must comment about the "Special Purpose Camera", however. Polaroid made those in the 70's, and they got phased out. Now they are back, and cost a much as the Polaroids did when they first came out! Hahaha! My parents had Polaroid Instant like that when I was growing up. I was so enamored with it! 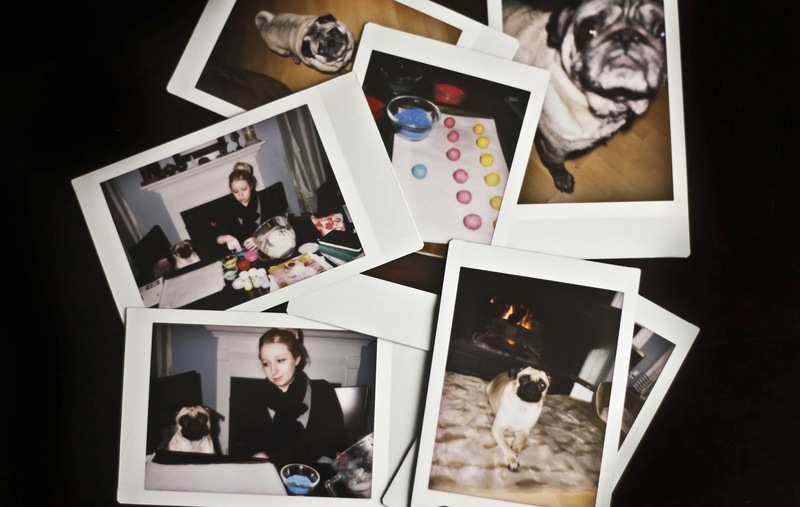 That's one of the reasons why I bought the Instax. I know this post is a bit old but I figured I would ask anyway--why do you have to boil the wine? Is it possible to make these if you skip that step? Just made these for a second time. The first time, I made all the usual mistakes: heat too high, thermometer not right for pan, etc, and ended up with burnt but hard candy. After my 260*F test, I was pleased that the mixture still looked purple and tasted like port. I filled a pan with ice water to cool the candy once it was done, and turned back to my candy. The thermometer now read 270*F and had already turned brown. In a frantic attempt to save the batch, I pulled it off the stove, submerged the bottom of the pan into the ice bath, stirred it for 1-2 minutes to disrupt the bubbles, and started free handing my lollies onto parchment paper. Unfortunately, the wine flavor is light and the slight taste of caramelization that I was unable to avoid is overpowering. HOWEVER, I know my thermometer is not wrong because my candies are still soft life a "soft ball" texture. This suggests to me that something else besides the sugar may be burning? I will have to investigate my "science of cooking book" and see if there is anything else I can do to avoid this. I love this idea!! I tried them today but I'm definitely doing something wrong. My first batch started to brown so I took it off .. the flavour was WONDERFUL but they remained soft ... sigh. My next batch tasted burnt as hell but it was a nice hard candy. My third batch was slightly burnt but still soft. I did some reading and found out that the temperature required to burn sugar is much higher than the hard crack stage (298 degrees F). So I agree with the last post, something else is causing the burnt taste. If someone finds out what it is, please let me know. i am wondering if this would work with zinfandel, or even pinot grigio? Hi there..I tried this recipe today. Used a small pan, brand new digital thermometer, etc and they too came out brown looking and burnt. At one point they were a beautiful red color and tasted divine and then even before it got to 298 degrees, that changed and they became odd tasting and brown in color. I am going to try again but this time not make a red wine reduction. I'm wondering if the double cooking of the wine could be the reason they are coming out burnt tasting. Second try, still not right... They appear hard, I've dropped one and it shattered, but when you put one in your mouth its like hard superglue... sticks to the teeth and quickly molds to your mouth. I read your instructions again and your secondary comments. I made sure the sugar reached 310 this time thinking this was the problem with the first batch but apparently not. I used light corn syrup, could that be the problem? HGTV bought the recipe from me to use on their site. If you look closely, you will see my name and website credited. Go back to the recipe and look for these words directly under the recipe name. 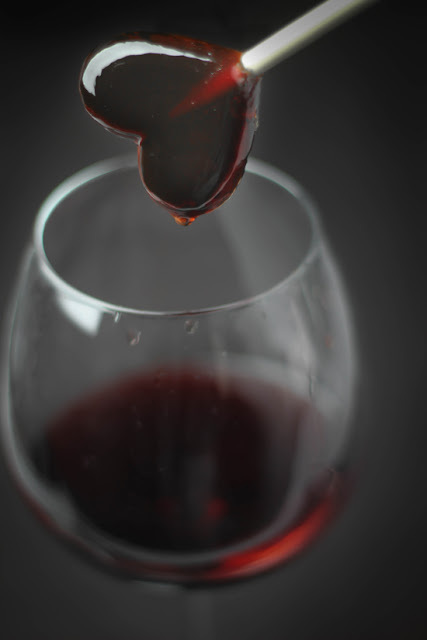 "Red wine is an unexpected ingredient to incorporate into desserts. These lollipops were created with Port wine, but you can experiment with your favorite variety of red. Filed under: Recipes, Valentine's Day"
Please pay attention to detail before you accuse someone of plagiarizing. Super disappointing. I spent time and money for a recipe that burned and set off my fire alarm! I followed your directions to a tee, made sure to use a medium pot (the same pot I use for other lollipop recipes with no issues), but it started to smell burnt around 285F. It was fully burnt when I removed it from my stove at 296F. You must have a special pot or magical stove. Before it even reached 260F, it started smelling burnt and turning brown. Perhaps doing the wine reduction and then making it using that is burning it? I'll admit to using cheap wine for my first attempt because of fear of wasting an expensive bottle. I'll try doing it without reducing it or just doing it on the lowest setting. Also, I have a question. Would substituting sugar with stevia work? I just made these in a pot that really wasn't deep enough for my candy thermometer to get a good read and they still turned out perfect! made them with red sangria and they are fabulous!! thanks for the great recipe.